Whether it’s your brother, husband, or friend, we all know that men are notoriously hard to buy for at Christmas. They mention a gadget they like but then buy it themselves three months before. There are only so many bottles of aftershaves you can purchase and not all men have a beard. Beard trimmer, beard oil, beard beads. It’s all about the beard on Google marketplace right now. Sick of gifting novelty socks? Now sorry if I have got all dull and old fashioned but I don’t subscribe to the buy yourself lingerie ‘for him’ train of thought. Just like when buying for yourself, the gift you give him should be in line with his personality and style. Yes, you may have to buy an adult male Lego figurines. Not included in our favourite choices below are experience days. Spend time together. One of the best presents I got for my partner was a day at the races. It goes without saying that I make awful bets. So, what are our choices for the hard-to-buy-man? For the man that needs a trim (or close shave. Many jokes could be made.) I would choose something a little different. Many, many brands of electric razor line the shelves at Boots but the likelihood is he already owns one. You could buy a shaving kit but if you don’t have a beard yourself how can you know what the best products are? Pick then a gift that keeps on giving, month after month. Sign up your deserving man for a BIC shave club flexible subscription to ensure they stay looking well-groomed all year round. You get a choice of two razors as well as picking how frequently you’d like to receive your pack of four refill blades. For top-quality products delivered straight to their door for as little as £4.50 a month this would make the perfect gift and is available HERE. For the man whose wallet is looking a little tired, I would send you shopping at Mainline. Most men carry their wallets all day, every day. Unlike women they are not weighed down by 600 store cards. Which is why I would choose for a sleek, modern, slim alternative the Tommy Hilfiger Card Holder. Mainline is a leading menswear retailer that stocks 85 designer brands. Made from stylish leather the pouch opening at the top and a woven navy, red and white striped panel on one side with a navy, white, red and silver coloured metal Tommy Hilfiger Flag logo stud shouts high end. Retailing at £35 HERE you will probably have a little left over to hide a £10 note in one of the folds. For that traditionalist, I would choose a subscription to The Summerton Club. Brandy buff or whisky connoisseur? If you, like my partner have a love of rare and aged spirits, half an inch of golden liquid poured over a tumbler of melting ice cubes than this is the gift for you. Or, do you stand in the supermarket isle having no clue which to pick? Let The Summerton Club do the searching, and for £50 a month you can have a carefully chosen bottle delivered to your door that you wouldn’t find in your local shops. The subscription includes free UK delivery and a price tag less than you’d pay yourself. Discover the perfect tipple HERE! For the man that loves his car. I would choose this stylish, slimline designed Nextbase 412GW Dash Cam. For car sharers or safe drivers this handy gadget offers peace of mind and should be as popular on the dash as a Satnav. This multi-award-winning model boasts some impressive features such as a onetime installation and Click and Go easily mounted system which means you can grab the cam and throw it in your purse so its not left at the car overnight. It is the perfect size not to distract the driver. Wide Dynamic Range ensures HD quality recordings in bright and dark light. Its Wi-Fi connectivity ensures footage can be easily uploaded to the smartphone App (Android & iOS). GPS logging records location and speed data to view your journey on Google maps. The inbuilt battery provides 30 minutes of backup in the event of an incident and G-Sensor automatically safeguards footage upon sudden impact. Its a winner. This easy to use Nextbase dash cam sells for £129.99 HERE. For the man that has a sweet tooth, I would choose a pack of sprouts that everyone will love! Gifts with a bit of a giggle always go down well with our household. Chocolate is not just a popular gift with women but men too and these sprouts make a great Christmas gift for anyone who loathes the sight of the much-hated vegetable. Handmade in the UK by Choconchoc the box of eight white chocolate delights are so realistic and are just the right size to slip into a stocking! I am tempted to hide a couple on my sons’ plate on Christmas day! The RRP is £8.99 and can be bought HERE. For the man that considers himself a bartender in training, I would visit the newly designed Prezzybox. Pick a unique, speciality liqueur bottled stylishly in a traditional 0,7L American style mason jar. Everyone likes a bottle of their favourite something during the holidays but why choose cider when O’Donnell has created Roasted Apple moonshine?! The perfect flavour for the festive season this high-proof spirit tastes perfect with a dash of coke. As an extra the gift set comes with a nifty pouring lid. It looks almost too good to drink! Grab it for £28.99 HERE and make sure you have ice in the freezer. For everyman. I would choose these responsibly sourced boxers from SueMe. I always buy my significant other underwear for any present giving event… Mainly because I colour his pink in the wash and loose half of his socks. There are 6000 brands of pants that I don’t understand so why not then pick something a little different and buy some (literal tree) trunks made from beech tree pulp. They sell HERE for £20, are comfortable, close fitting and breathable. A nice touch is that each parcel includes a packet of seeds to give a little something back. For the man that loves a series, I would choose NOW TV every time. You might consider a Vue cinema voucher or a box set but if you want value for money then we suggest the new NOW TV Smart Stick and subscription. The perfect stocking filler it is contact free and for only £14.99 offers Catch up TV, unmissable shows and blockbuster entertainment. With instant set up and voice search it is a convenient and simple to use product that can travel with you! As a bonus you can now access Netflix through the Now Tv stick! Available HERE Now Tv has become this families firm favourite over Amazon Prime and the other streaming Apps! You can buy Sky Sports pass to really sweeten the deal. For the well-dressed man (or one in need of some style!) I would choose a high-quality dress shirt. A staple item (or items) that should be found in every man’s wardrobe in all kinds of colours, styles, fabrics and patterns Dobell offers the perfect place to buy clothing perfect for the festive white tie events. Don’t be afraid to step away from classic; this wing collared, Marcella fronted shirt is made of cotton rich fabric and well sized. The perfect fit. If you want value for money the in-house label never disappoints, and this shirt is designed to match other items in the range if you feel like going all out! Featuring stud buttons and woven cuff links, this wardrobe winner is available HERE for £39.99. For man’s best friend, I would choose this stylishly designed yet incredibly functional, dog walking bag. Offering everything you need for walks with your dog, this bag ensures you won’t find yourself short of essentials at the park. Travel Wags has created the perfect bag for everyday and included within are an ergonomically designed water bottle, collapsible water bowl, one pack of biodegradable poo bags in a nifty pocket, which functions as a dispenser, plus interior and exterior pocket for treats, mobile phone, keys etc. The fabric is waterproof and easy to clean for when your fur family makes a mess. Much easier than trying to stuff things in your pockets and at £64.00 it is worth the investment. I love the fabric and style and my partner would happily use this as a day bag even without the dog! Buy it HERE. For the man with ink, I would choose this vegan-friendly, cruelty-free skincare from Electric Ink. Created with a mixture of oils and vitamins that work to nourish the skin it protects the tattoo. 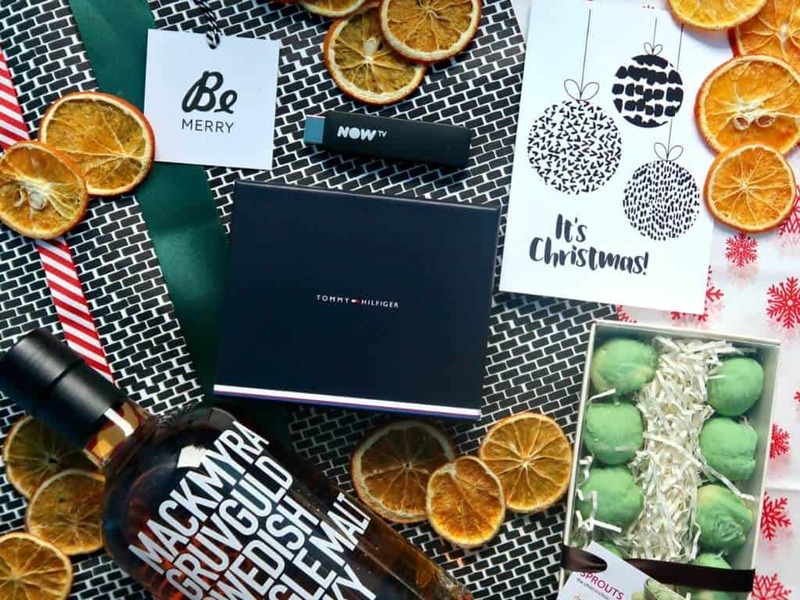 Included in the giftbox is everything needed for tattoo aftercare: Vibrancy Serum, Defining Body Oil, and Daily Moisturiser all for £32.99 Every product can be easily incorporated into an established skincare routine. (Or it this gift offers the perfect time to establish one!) Hydration stops fade and the products are non-oily and leave no stain on clothes. One of my favourite things has to be the packaging and you can get your own HERE . To help with the present buying for the menfolk we are offering a £50 Amazon gift card to one lucky winner. Competition end date is the 7th December. Any other ideas for the man in your life? My brother once asked for a tin of hot dog sausages, have you ever had any strange requests? Note: We were kindly gifted these items to include within the Guide #AD.